Originally published in Music Week on 27 March 2019. 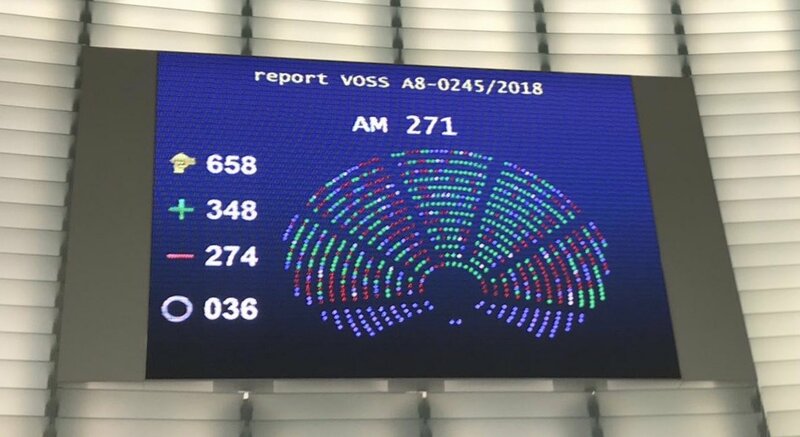 When the Copyright Directive vote started in the parliament, my heart was going like the clappers. You have to follow the vote on a giant blue screen. This involves waiting for what seems like an eternity for numbers to appear next to a big green plus and a big red minus. You need to blink a few times to make sure you are reading it correctly. Those green plus and red minus figures sent a clear signal. Culture matters. Creators matter. Copyright matters. The result was down to three things – parliamentarians taking a stance, artists and other creators showing their support, and the united front of the cultural and creative sectors. We were a small cog in a big wheel that kept turning because music, books, newspapers, photography and beyond all pulled together. The most powerful message on the importance of the vote I have seen is the inspired Love Letter from Silicon Valley post by author, computer scientist, virtual-reality pioneer and musician Jaron Lanier. It is an entertaining and sobering spotlight on the issues at stake. In the end it became pretty clear that the plan was simple - get rid of Article 13 altogether. Just last week, the independent sector along with authors, artist groups and managers, penned an opinion piece about how the Directive was the product of “the fine art of democratic compromise”. We called it the“beauty of the beast”. The mobilisation around the goal of getting the beast over the line was impressive, in particular artists and authors who stuck their heads above the parapet. The powerful rendition of Just Say Yes told a great story, with young and emerging musicians getting their message across about a fair future online. The aptly named song was originally released by Snow Patrol. When Jean-Michel Jarre heard about it, he sent over some synth and also released another video with the music the night before the vote, featuring other artists just saying yes. In just three days, over a thousand artists signed the #manifesto4copyright launched by parliamentarian Helga Truepel last week. In France over the weekend, over 170 artists put their case across in a high-profile feature in newspaper Le Monde. To stand up in today’s environment is no mean feat. We have heard many buzzwords to argue against the new rules – “censorship machine”, “upload filters”, “link tax” etc. Another favourite was “unintended consequences”. It is right to be concerned about the impact of any legislation. We all want it to do a proper job, but the ongoing attacks disregarded the multiple revisions, each time addressing concern upon concern. Yet it was never enough. There had to be a reason why the onslaught continued, despite the safeguards. Why did the goal posts keep changing? In the end it became pretty clear that the plan was simple - get rid of Article 13 altogether. The plan failed. We will now be in a better position to negotiate for the use of our works by platforms making a profit from creative content. Article 13 also helps give teeth to the provisions that benefit authors and performers such as fair remuneration, transparency, contract adjustment, revocation of rights etc. Citizens and small platforms will also be in a better position and we would do well to shout about that, as the Directive will continue to be undermined. This is already the case. The names of the parliamentarians who voted yes have been posted by the Pirate Party Julia Reda, and they will be attacked. We must step in to support them now more than ever. Questions will also be asked about the way certain operators have been using their networks to influence public opinion. That will be one of the key issues with the European elections just round the corner. The next step on copyright is for the member states to re-approve the text and then they will have two years to transpose it into national law. It will be key to ensure that the balance in the final text makes it way into each country in a meaningful way. There may be attempts to derail that process, so we will need to be ultra united and ultra co-ordinated for the next phase and not just in the music sector.